Everyone has an enemy. At age 15 mine was an enemy of the most vile sort, an ex friend. We had played together as children. We had ridden horses all over the combined acreage of our families and beyond. She taught me how to ramp four wheelers and do donuts. We nearly died together multiple times. She taught me how to drive. Alright, so her teaching me how to drive actually involved her coming over to my house and persuading me to take out the truck destined to be mine into the front pasture for lessons while it was loaded up with five hundred pounds of wooden posts and the ground was wet. It ended poorly, go freaking figure, but it was educational! I learned that you can’t really rock a five speed, burned clutch smells AMAZING, and believe it or not cat food does not give traction to F250s. I know. I know. Mind blowing, right? I also learned that my parents have the world’s best senses of humor in the history of life. They got home and noticed the truck was missing. Panicked. They saw it in the pasture and my then friend and I came flying across the expanse on her four wheeler, arguing and bawling, as I told her that I was not going to lie to them and tell them someone tried to steal the truck. Then they started laughing their asses off. I’m pretty sure that if I had normal parents I would be dead. If my poor four wheeler driving skills had not ripped the down spouts off the barn with the manure spreader, maybe anyone else would have thought it was funny; but I doubt it. I’m trouble. Trouble. Trouble. Trouble. Actually, I was a pretty straight-laced kid which is why my then friend and I split up. I wanted to stay home and read. She wanted to go out and drink. It led to some quarrels as you can imagine. Then things escalated. We would come home to find the horses loose. Gates pushed inward so it was obvious the animals did not unchain them themselves. There were flip flop prints! Trees were mysteriously cut down across the driveway. Mischief was everywhere. It ran rampant. We had to bicycle lock the paddocks closed after one particularly bad fight amongst the stallions. But the crowning glory was that poor old truck. To this day there is some debate about what really happened, but I am telling you the tale as I believe it. Mostly because if I am wrong then I caused even more property damage and should probably be an indentured servant right now. The old grey F250 was the farm truck. Earlier that day I had loaded it up and taken the trash back to the holler for disposal. I parked it in its place of honor beside the granary as I always did, which is to say in neutral with the parking brake on. (Appropriate parking was not included in my lessons. Give me a break!) I thought nothing of it. It was the same scenario that had played out a thousand times before. I left the truck and went over to a friend’s house until after dark. About nine pm my dad heard the horses making a ruckus outside and went to investigate. He shone the light around and saw no horses loose and then he noticed it. A faint glimmer from the lake behind the barn. He walked closer. 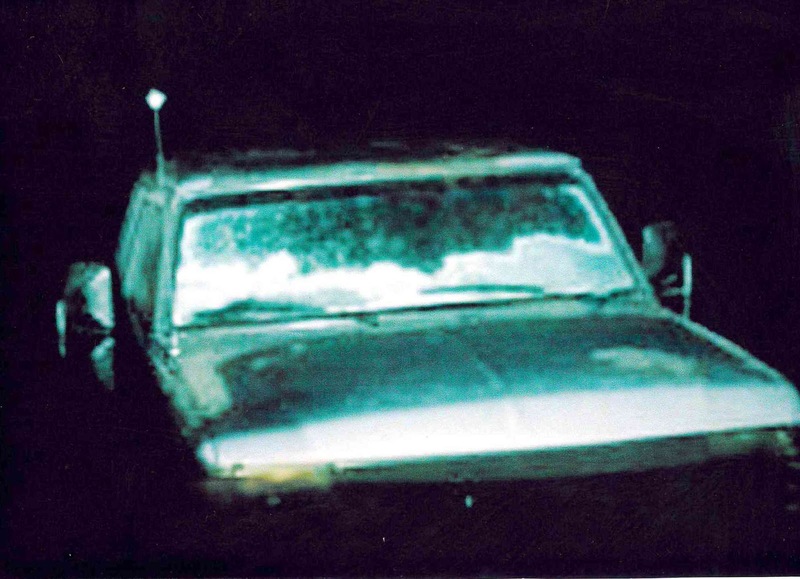 The narrow beam of the flashlight illuminated an empty space where the truck should have stood. With a sigh he turned the light towards the double gates by the barn, as he feared they were standing wide open from the force of a two ton pick-up truck rolling backwards down a slight incline. He walked through the gates, sure now that he knew what the glimmer was in the lake. The silver of the hood was just barely visible through the murky water. The headlights shone through the liquid like blurry mirrors reflecting the fiery anger back at him that I am sure he must have felt in that moment. In the distance an owl hooted. Without a word he returned to my mother in the house. “That’s something you don’t see every day.” He said with characteristic aplomb. “What was it?” She asked, expecting another escapade. Yes, they made me swim out and hook a chain to the truck so that we could pull it out with the tractor. And that is how I learned what a lee spring is. Mom stood on the bank cracking jokes about my failed attempt at a drive through carwash, as I freaked out about shorting wires and being in a LAKE. To occupy my time I took stock of the mushy surroundings and noticed that the parking brake was no longer set. The owl hooted again, and over the sound of the tractor I still swear I heard my former friend's laughter. This hangs over my dad's desk. Talk about a sense of humor.